Louis Vuitton has named Virgil Abloh the artistic director of its menswear line. Abloh, a longtime creative director for Kanye West and founder of the Milan-based fashion label Off-White, is the first African-American to hold the title at the European luxury brand. The Rockford, Illinois, native told The New York Times he was “elated” with his new position. “This opportunity to think through what the next chapter of design and luxury will mean at a brand that represents the pinnacle of luxury was always a goal in my wildest dreams. And to show a younger generation that there is no one way anyone in this kind of position has to look is a fantastically modern spirit in which to start,” the 37-year-old said Monday. A first-generation Ghanaian-American, Abloh had no formal training as a designer. He learned from his mother, a seamstress. 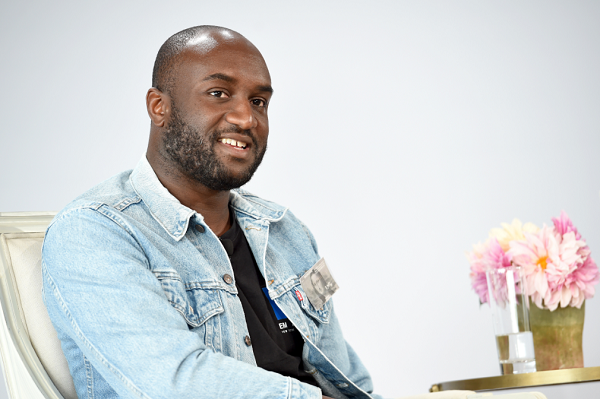 A two-time graduate, Abloh received a master’s degree in architecture at the Illinois Institute of Technology after obtaining a civil engineering bachelor’s degree at the University of Wisconsin-Madison. Over the years, the streetwear designer became synonymous with cool, creating off-the-cuff threads for a generation of shoppers who didn’t subscribe to the fashion industry’s seemingly outdated style norms. Launched in 2013, Off-White referenced Abloh’s own mission to break down the old barriers within the industry by infusing simplicity and comfort with luxury. The popular label was a finalist for LVMH’s Young Designers Prize in 2015, making Abloh the first finalist to land a top design role with Louis Vuitton. Before becoming the creative director for Louis Vuitton’s menswear, Abloh collaborated with a number of high-end brands including Jimmy Choo, Moncler, Takashi Murakami and Nike. But it may be Abloh’s connection to West for which he is best known. He has worked with the rapper since 2003, designing merch for tours, overseeing creative direction for music videos and designing West’s album covers. In addition to Abloh’s fashion pursuits, he is an international DJ, spinning at shows in New York City, Miami and South Korea. He previously had a residency at XS Nightclub in Las Vegas. Abloh, whose primary residence is Chicago, with his wife, Shannon Abloh, is expected to uproot his family to the LVMH Moët Hennessy Louis Vuitton headquarters in Paris. His appointment follows the departure of Kim Jones, who left the company in January for a creative director role at Dior Homme.